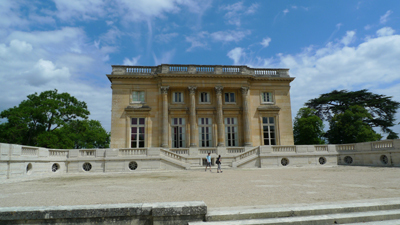 The not-so-small Petit Trianon at Versailles. Like I said in my blog a couple of weeks ago, Versailles is so big that one post is just not enough. Marie Antoinette’s Petit Trianon was the little country cottage way, way down the garden at Versailles. It takes about 45 minutes to walk there, and that’s at a firm brisk pace. When I arrived, “petite” wasn’t the word I was thinking of. “Mansion” was more like it. Big mansion. The Petite Trianon was not built for Marie Antoinette, though she is its most famous resident. The house had been built by the King Louis XV for his mistress, and was given to Marie Antoinette by Louis XVI. They’ve done a lovely restoration to the place. I saw a documentary on the Petit Trianon and it had been in a pretty poor state. It now looks fresh and painted in colours that truly remind me of a mix of Laura Ashley, Catherine Kidson and colourful cupcakes. Marie Antoinette was probably the inspiration for all this. As I went through the house, I gained a better appreciation for the different fabric prints and colours that she used. By comparing her tastes in the Petit Trianon to the château, I learned how different she must have been to the French court. I still do not know too much about Marie Antoinette. Much as I enjoyed the movie with Kirsten Dunst, it’s not enough information to decided whether she truly was insensitive and out of touch, or simply misunderstood. Maybe she just needed a better PR manager. What a totally fascinating blog! It never occurred to me that Marie Antoinette might have had her own style, and that her little house in the country would reflect that. I love your pictures, they make your case so eloquently. I have never been to Trianon, but it’s going at the top of my list of places to visit. Thank you!